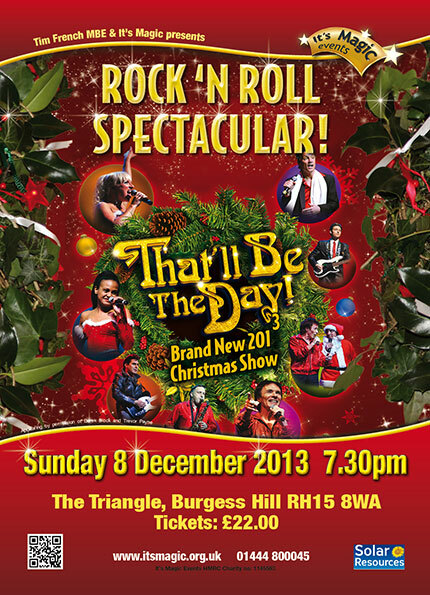 Prepare yourself for a party as the legendary That’ll Be The Day, the nation’s longest running rock ‘n’ roll variety show returns by popular demand with a Brand New Christmas Production. This hugely entertaining rock ‘n’ roll spectacular features a fantastic line up of knock-out hits from the 1950’s, 60’s and 70’s. A fresh and astonishingly versatile programme of music mixed with loads of new zany comedy routines to produce a show with a real feel good party atmosphere. Tickets only £22 (tickets purchased will not be posted but available for collection from the reception desk at The Triangle from 6.30pm this Sunday 8th December).